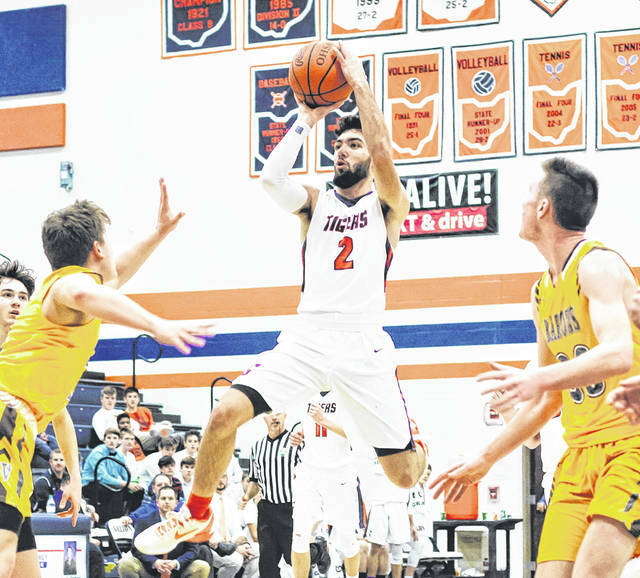 GALION — With the boys high school basketball season at roughly the halfway point, the Mid-Ohio Athletic Conference statistical leaders are constantly being updated to let fans know exactly what players are making the biggest impact in scoring, rebounding, assists, steals and blocks per game. Some stats have been reported through as few as eight games played and up to 11 games played as of the Galion Inquirer’s Tuesday morning deadline. In the scoring category, Galion junior Isaiah Alsip sits atop the leader board with 202 points scored with 10 games reported, good for a 20.2 points per game average. AJ Kenney of River Valley has 207 points in 11 reported games for an 18.8 points per game clip. Dylan Herbert of the Buckeye Valley Barons has 160 points through 10 games, good for a 16.0 average. Kenney’s teammate for the Vikings, Ethan Bell has 171 points through 11, giving him an average of 15.5 and Shelby’s Uriah Schwemley rounds out the top-five scores with 167 points through 11 games which averages out to 15.2 per contest. Kenney makes another appearance in the leader boards, this time he sits atop the rebounding category with 10.5 per game. Galion senior Gage Lackey is in the number two spot currently with 8.7 per contest and Shelby’s TJ Pugh pulls in 7.8 boards per game. Clear Fork’s AJ Blubaugh finds himself in the four spot with 7.3 rebounds per game and Ethan Warner is averaging 7.1 on the glass to round out the conference’s top five. Bell sits as the top distributor in the MOAC, dishing out an average of 6.6 assists per game for River Valley while the Whippets’ Schwemley sits in second place with a 4.5 average. Brennan South of the Clear Fork Colts is in the third spot in the assist leaders, averaging 3.6 dimes a game. Griffin Shaver of Ontario comes in fourth with 3.2 per contest and the Colts’ Blubaugh rounds out the top five with 3.0 assists per game. Alsip makes another appearance for the Galion Tigers, this time as the league leader in steals at 3.1 per game, ahead of River Valley’s Dylan Johnson at 2.7. Gage Williams of Pleasant currently sits in third with 2.3 swipes per matchup will Pugh from Shelby sits in fourth with 2.2. Buckeye Valley’s Dylan Thompson rounds out the leader board in steals with 2.1 per game, good for a fifth place standing. Rounding out the defensive categories are the top shot blockers in the MOAC, led by River Valley’s Adam Hawk at 2.4 blocks per game. Hunter Hoffman of Shelby is second with 2.0 blocks and Troy Scowden of the Buckeye Valley Barons is currently slotted in at third with 1.8. A pair of Galionites round out the top five as Jack McElligott (1.7) and Lackey (1.3) finish up the category at fourth and fifth, respectively.